The earliest landscape paintings could not stand alone, but formed the backdrop to other genres, particularly narrative works. In the great majority of cases, artists leave clear and unambiguous evidence as to whether the figures in a landscape are intended to be part of a narrative. Whether Poussin or Turner, most narrative landscapes make that clear to the viewer. 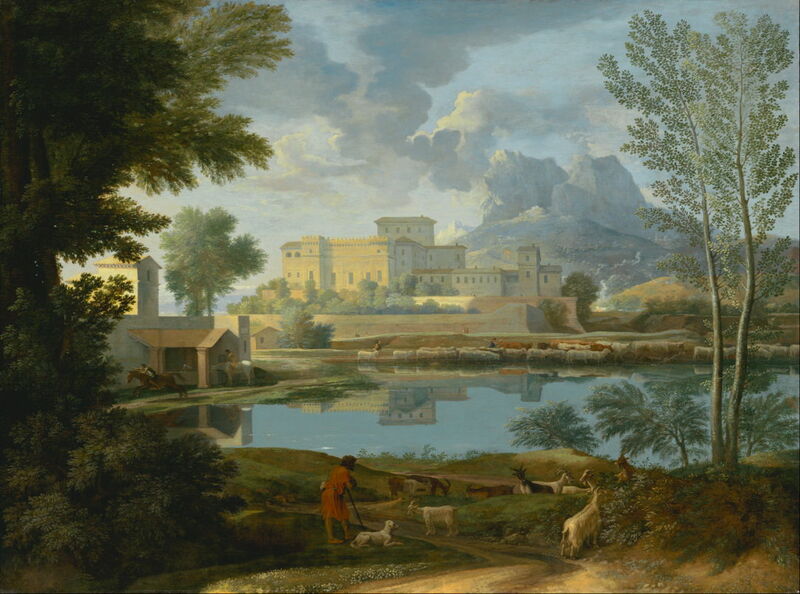 Where Poussin did not tell us that a painting was narrative, as in his wonderful Landscape with a Calm (c 1651), we are safe to assume that its figures are just what we might expect in a real landscape: narratively incoherent but essential to it. Some artists have, though, gone out of their way to challenge the viewer. 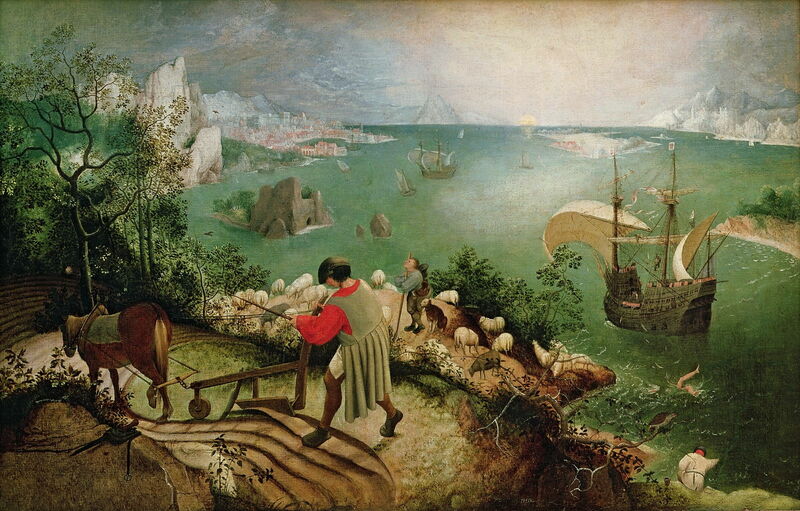 This copy of Brueghel’s Landscape with the Fall of Icarus provides minimal clues: a pair of legs thrashing in the water, a few feathers floating down in the air above them, and a shepherd looking up at the sky. 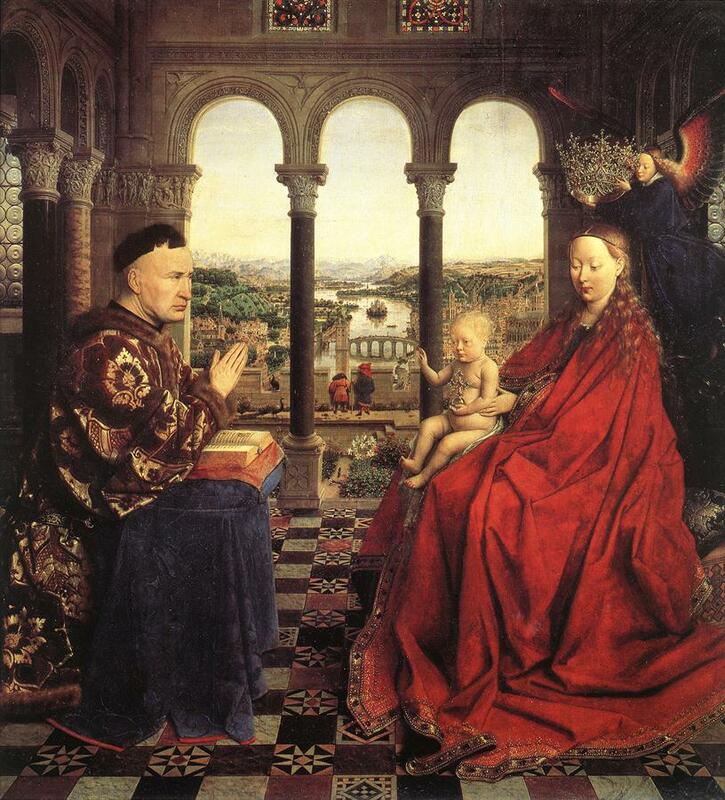 Even in the early Renaissance, and characteristically in its northern section, landscape miniatures incorporated within religious and other paintings were populated with figures. 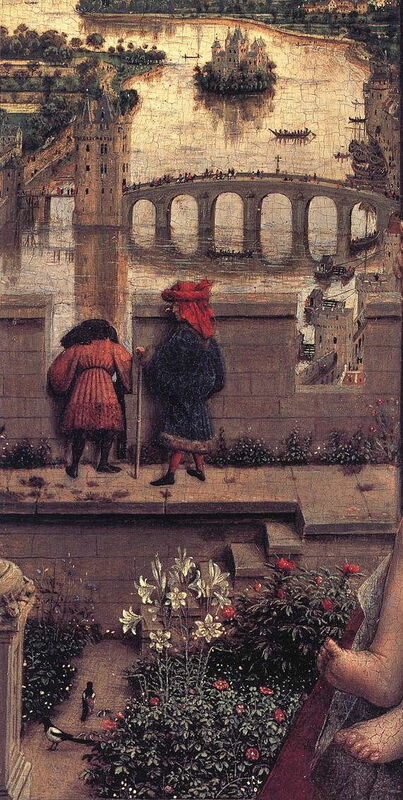 Look behind the principal actors in Jan van Eyck’s The Madonna of Chancellor Rolin (c 1435), beyond the open arches, in the detail below, and two small figures stand at the castellated wall, their backs towards the viewer. Go even deeper into the painting and there are crowds crossing the bridge, and two small boats are packed to the gunwhales. These figures are pure staffage: a word actually borrowed from German, but formed in pseudo-French, from staffiren, meaning to fit out or garnish. It is properly used to describe all the accessories of a picture or painting, but most commonly applies to the human and animal figures, and their mobile equipment such as carts. It could equally be used of vegetation and other objects which were not in the original view, but were added by the artist for ‘effect’, such as some trees used for repoussoir. 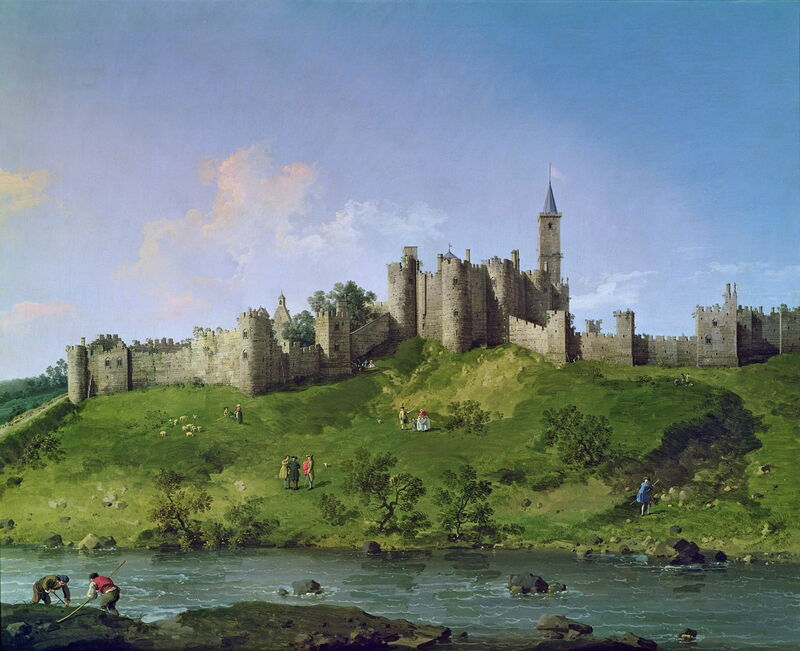 In Canaletto’s fine view of Alnwick Castle, painted in about 1750, figures are dotted fairly evenly across its very green grass. Only one group appears to be working at any real activity: the two men in the foreground, at the lower left corner, who seem to be using a crowbar on something in the riverbank. 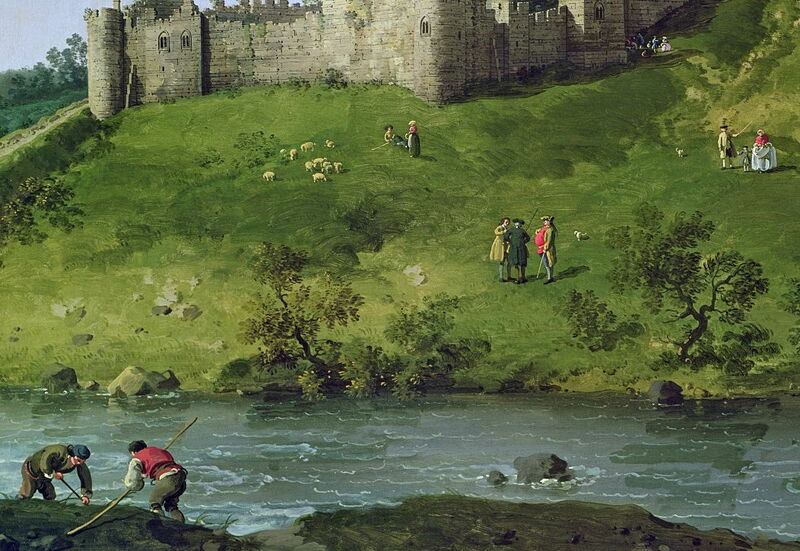 Around the castle, there is a shepherd and companion with an unrealistically tiny flock of sheep, and three small groups of people talking, looking, or just present. These all seem remarkably everyday, even humdrum. Foreground figures can be vital for instilling a sense of scale to the whole view. 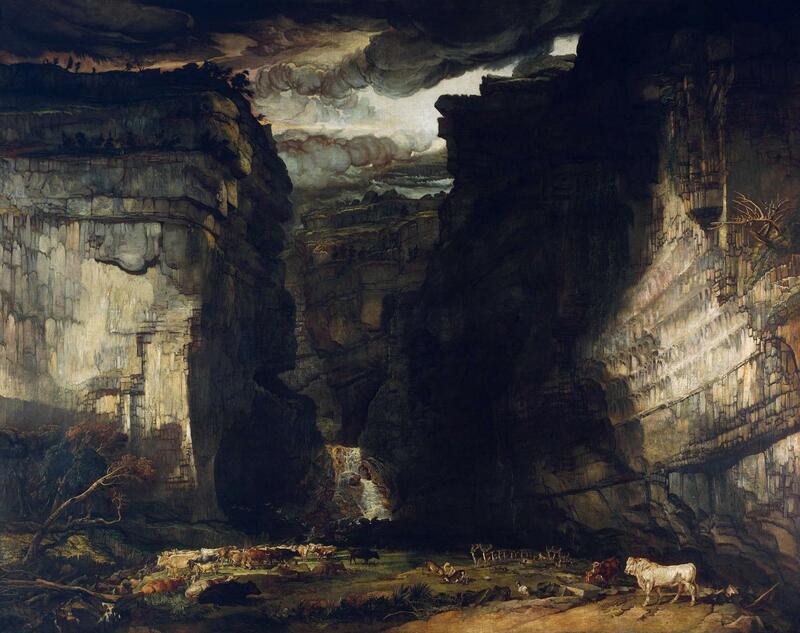 James Ward’s vast and imposing painting of Gordale Scar (1812–15) benefits greatly from the herds of cattle and deer at its foot. Without them it would be easy to misjudge the scale of the cliff faces and the huge cleft in them. 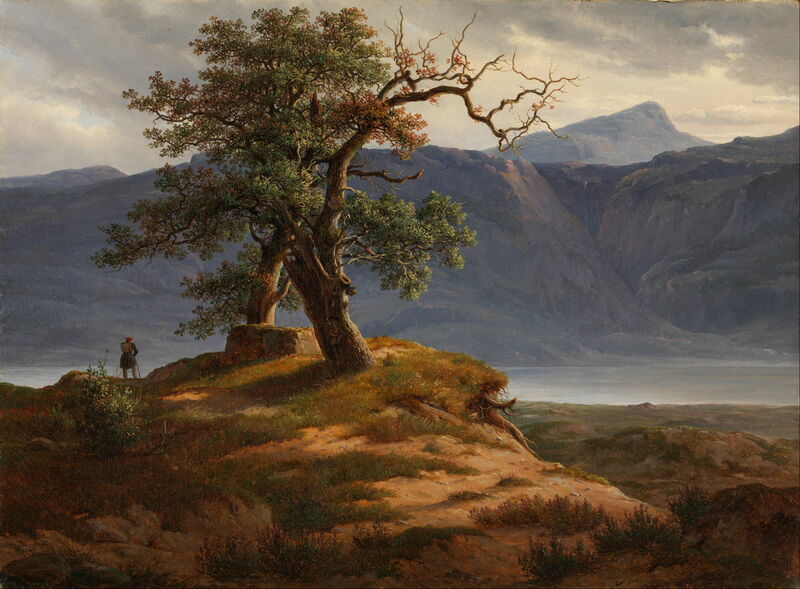 Thomas Fearnley (1802–1842), Landscape with a Wanderer (1830), oil on canvas, 49 x 66.5 cm, Nasjonalgalleriet, Oslo. Wikimedia Commons. Thomas Fearnley is by no means the only landscape painter to have used little figures to draw the viewer into their highly detailed landscapes, and make them marvel at seeing what they could not have seen in reality. It’s a very effective trick which adds interest to a view, and enriches the dialogue between the artist and viewer. 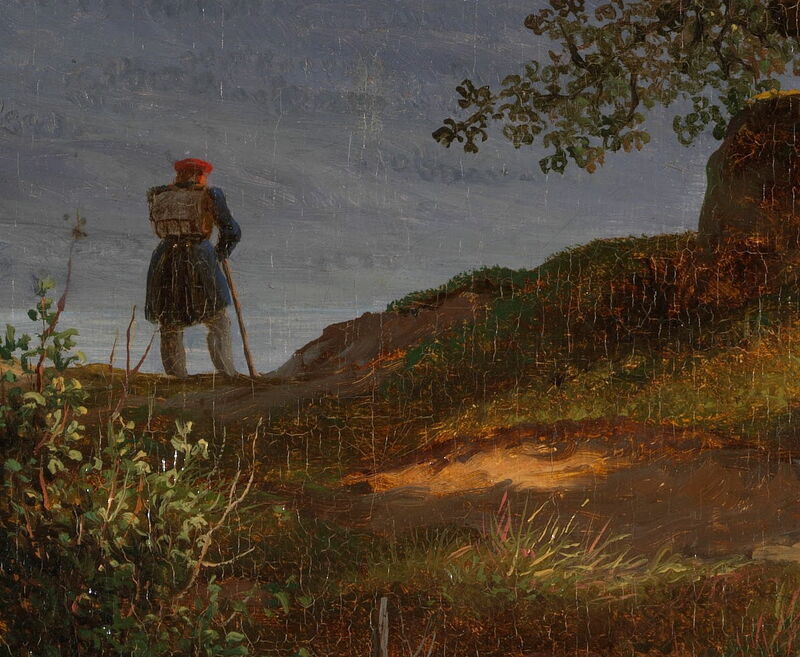 Thomas Fearnley (1802–1842), Landscape with a Wanderer (detail) (1830), oil on canvas, 49 x 66.5 cm, Nasjonalgalleriet, Oslo. Wikimedia Commons. 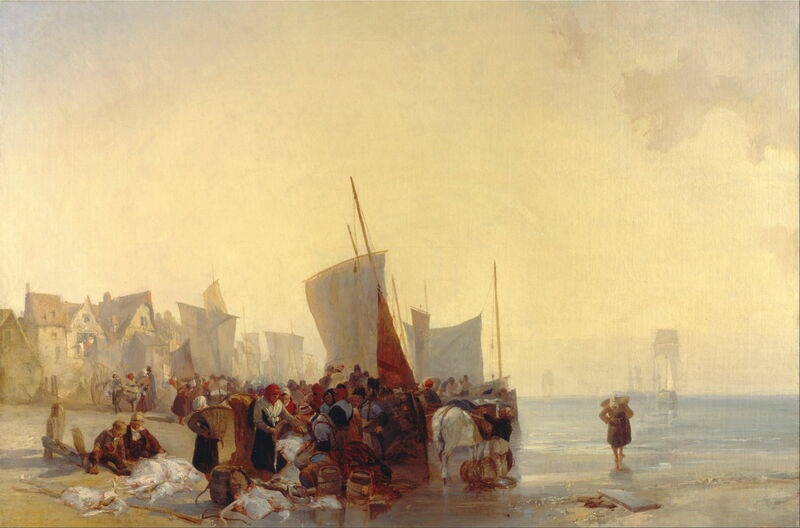 Staffage is even less appropriate when much of the substance of the landscape are its inhabitants, as in Richard Parkes Bonington’s Fishmarket near Boulogne (1824). His fishmarket is the people, with the backdrop of the sails of the fishing boats illuminated in his golden light. Yet many of those figures are gestural, only partly formed or suggested: it is the mass of their assembly which is such an important part of his motif. 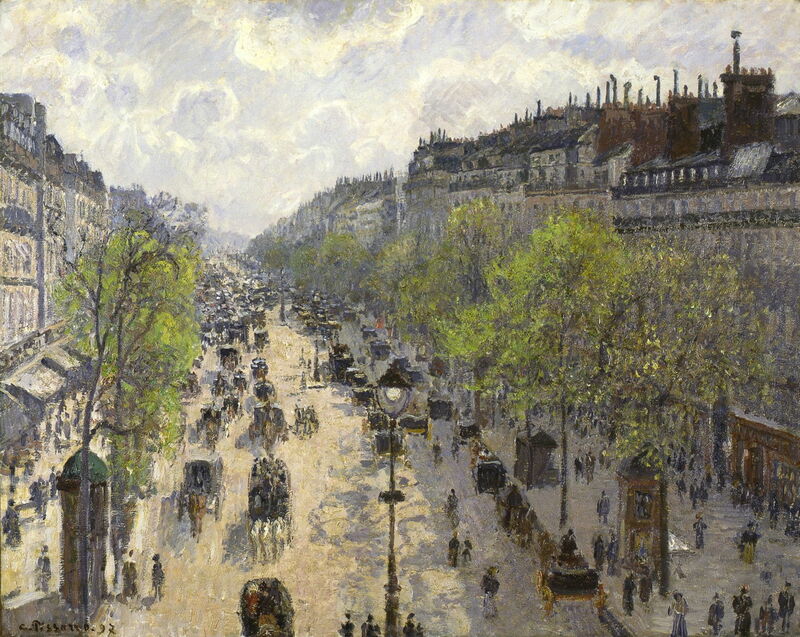 Pissarro’s Boulevard Montmartre, Spring (1897), also changes the balance between figures and landscape: this is a landscape composed primarily of buildings and streets, a plethora of figures, and countless carriages to move those people around. 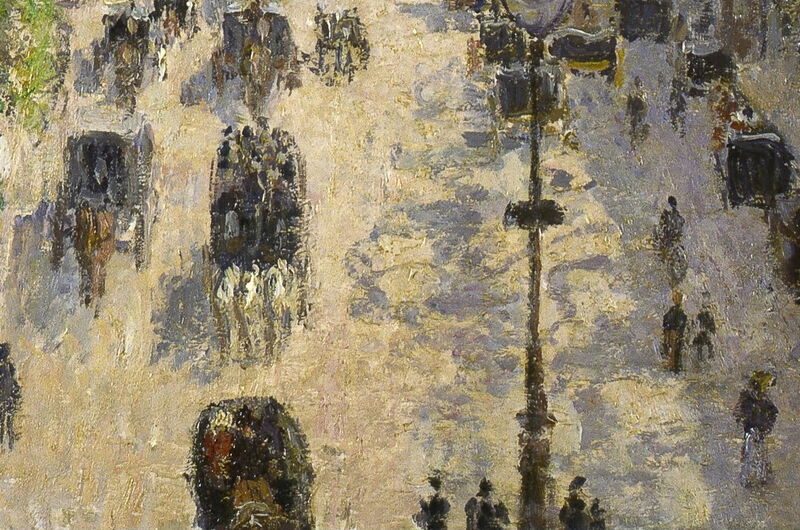 As shown the detail below, Pissarro forms each figure quite roughly, but in sufficient detail. Three white horses range in tone and colour, with highlights on the front of each head. You can see which people are wearing hats, and spot ladies in their fashionable clothing. 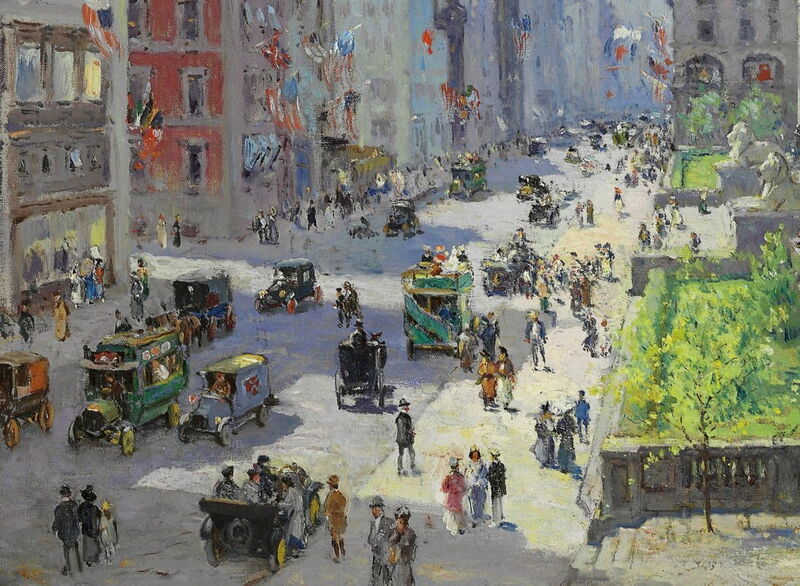 Colin Campbell Cooper’s approach to cityscapes is quite different to Pissarro’s. 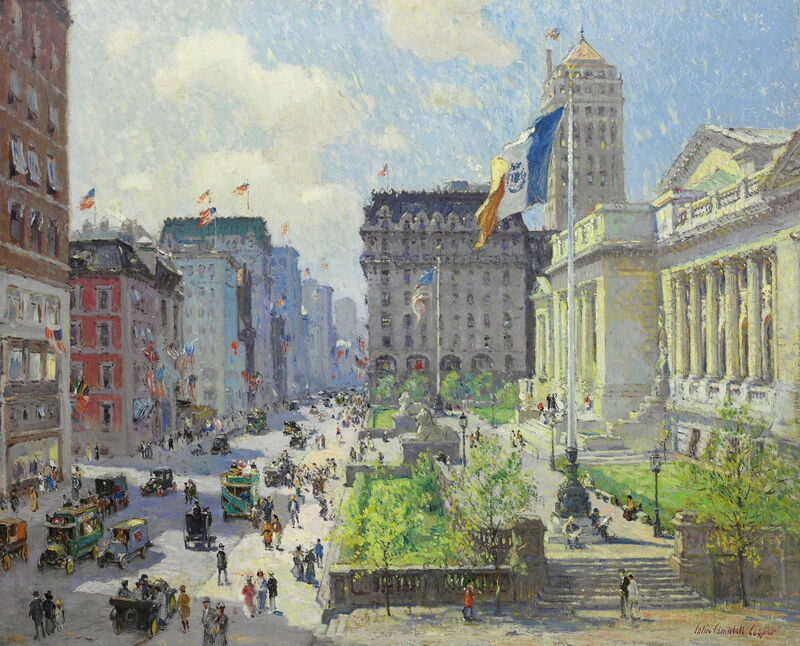 The buildings – which at first seem to dominate his paintings – provide backdrop, rhythm, and vertical form. All the finer details, over which he must have lavished such care and attention, are in the figures, vehicles, and the action in the street. The figures may be Lilliputian in scale, thanks largely to his elevated and distant viewpoints, but they are essential to the image. Some landscape painters, who struggle to paint realistic figures, team up with figurative painters to paint spectacular works together. Adolph Tidemand and Hans Gude’s Brudeferden i Hardanger (Bridal journey in Hardanger) (1848) demonstrates how effective this can be, both artists working in meticulous detail to produce what appears a seamless integration. 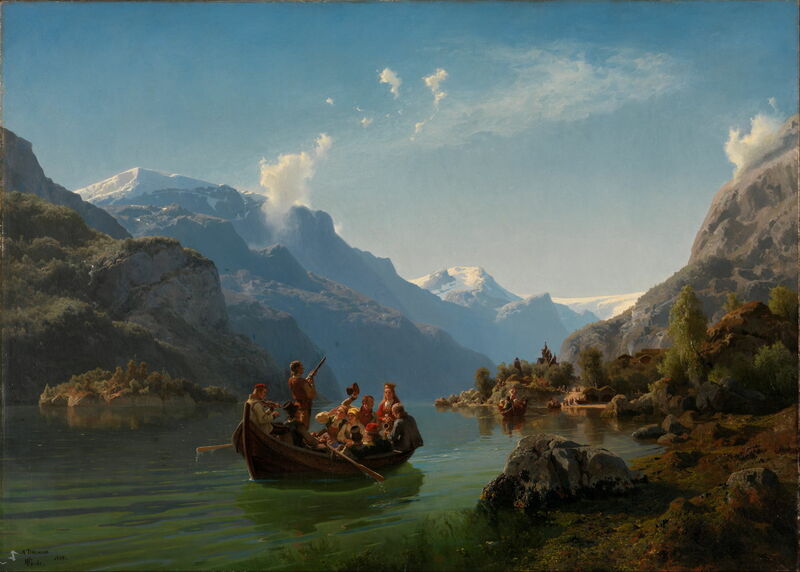 Adolph Tidemand (1814–1876) & Hans Gude (1825–1903), Brudeferden i Hardanger (Bridal journey in Hardanger) (1848), oil on canvas, 93 × 130 cm, Nasjonalgalleriet, Oslo. Wikimedia Commons. 13 Conclusions and contents (this article). Posted in General, Painting and tagged Bonington, Bruegel, Brueghel, Canaletto, Cooper, Fearnley, Gude, index, landscape, narrative, painting, Pissarro, Poussin, staffage, Tidemand, Turner, van Eyck, Ward. Bookmark the permalink.